The usd to cad, like many other currency pairs, is entering a phase of sideways consolidation as evidenced with yesterday’s candle which closed as a long legged doji marginally below 14 day moving average. 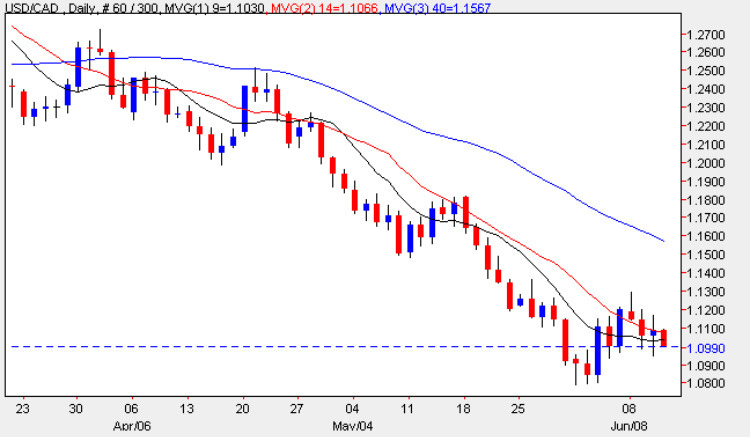 Many of the currency pairs, particularly the majors, are now consolidating as the market waits for the next directional phase for the US dollar which appears to have stabilized its recent decline as we can see on the dollar index chart which is now attempting to re-base around the 80 level. Naturally should we see dollar strength return in due course then this will reflected in the dollar to cad chart and for the time being we should expect prices to swing between 1.08 and 1.12 as we await some momentum to return to the market. The only item of fundamental news on the economic calendar for Canada today is a speech by Bank of Canada Governor, Mark Carney, and all the other US dollar related news items can be found on the main Eurodollar site.